When you deploy Microsoft Exchange on premise, it’s installed on your own hardware and configured however you want. You have full control over where it’s hosted, when it’s updated – everything. Because you’re not relying on someone else’s hardware and because emails can be stored and served locally, an on-premise Exchange can be faster than an online one. Having full control means you have the freedom to customise your Exchange. You can even modify its behaviour with third-party plugins, if you want. Once it’s set up, there are no subscription fees to pay. With an on-site server, you are responsible for the hardware and the configuration of software. If anything goes wrong with either, then you could experience downtime, and it will be up to you to get things on track again. 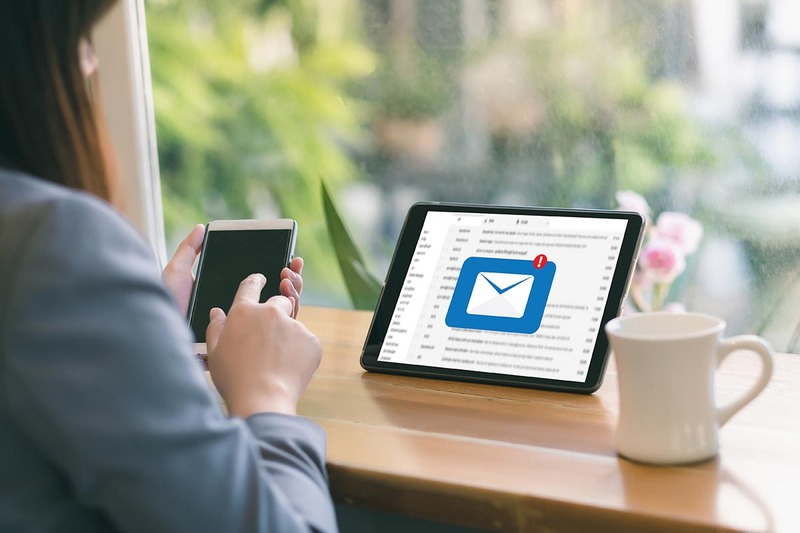 To help avoid downtime, you will need to make sure that your email server and your copy of Exchange are both maintained and kept up to date. With an on-premise Exchange, you will need someone who is capable of monitoring and operating your server. That could mean hiring an in-house specialist or using an external supplier. Servers are not cheap. It can easily cost several thousand pounds to buy one and to keep it working. Servers can be big, bulky things, and they need to be powered, which will add to your expenses. Adding multi-factor authentication is only possible with a third-party addon. Microsoft offers guaranteed uptime of 99%, so your service should be there practically any time you need it. Because Exchange Online is a subscription service, you have low up-front costs and your monthly expenditure on your email service is easy to predict. You don’t need to buy or maintain your own server, which will save you time and money. As a cloud service, you don’t have to worry about updates for Exchange Online, because Microsoft will take care of them automatically. Setting up new mailboxes in Exchange Online is quick and easy. If your business is growing quickly or your staff turnover is high, this flexibility can be invaluable. 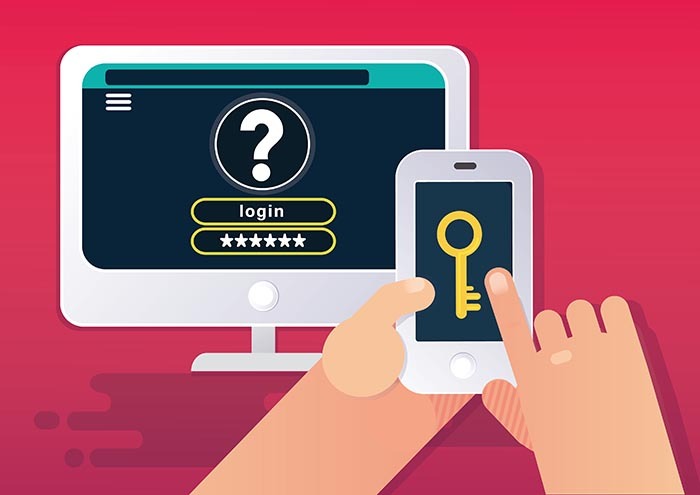 Exchange Online offers multi-factor authentication, which significantly cuts the chance of people gaining unauthorised access to your user accounts. Although you can sign up to Exchange Online on its own, it also comes as part of most Office 365 business plans. Inevitably, you giving up some control when using a cloud service of any kind. You can’t usually determine where your data is hosted or on which hardware, for example. Although you will save money not having to buy a server, Exchange Online comes with ongoing fees. Depending on the size of your business, it might work out more expensive than an on-premise server. In some cases, Exchange Online might not be compliant with certain regulations. For example, if your business is related to national security, you will need to check to see if Exchange Online complies with any restrictions that are placed on you. For the majority of businesses, the benefits of Exchange Online far outweigh any drawbacks. It’s fast, convenient and affordable. There are, of course, good reasons why you might want or need an on-premise server instead, particularly if you have strict security requirements. But probably the best solution of all is a hybrid deployment. So rather than Exchange Online vs on-premise, it’s a matter of Exchange Online and on-premise. That way you get the advantages of both systems. It's also important to remember that neither Exchange Online nor Exchange on-premise comes with backup by default. There are some undelete functions, which people often mistake for backup, but they don't offer long retention times or features to stop accidental overwriting. Whichever deployment type you use, you should make sure you have a backup and disaster revovery solution and/or Office 365 backup. If you’re unsure which kind of deployment is right for you, please contact TMB, by emailing info@tmb.co.uk, or call 0333 900 9050. 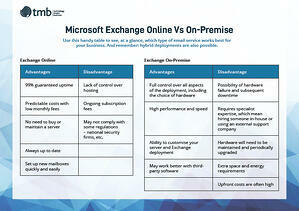 Click the image below to view and download our quick-view reference sheet listing the pros and cons of Microsoft Exchange Online vs on-premise.